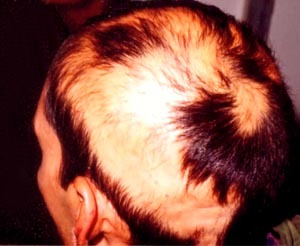 A thirty two year old male was suffering from patchy loss of hair from scalp since 8 years. The photograph of scalp was taken for clinical assessment. The patient had already tried various mode of treatment including various hair oils and shampoo without any improvement. The family history of the patient revealed that his father was having same problem which was cured by homoeopathy. Initially he was not benefited by long homoeopathic treatment, it despaired him a lot. The case of the patient was taken thoroughly and was repertorized by Kent Repertory. After listening his complete narration, I came to know that during his work he used to listen to music loudly which according to him gives peace and concentration to work. After completing the work on demand he was always afraid as if the costumer will discard it and abuse. I also observed involuntary motion of his hand during conversation as if he is still stitching something. He was also suffering from constipation since 8 years. After case taking the following rubrics were selected for Repertorization. Delusion as if he is insulted. After repertorization Tarentula Hispanica was selected for prescription. 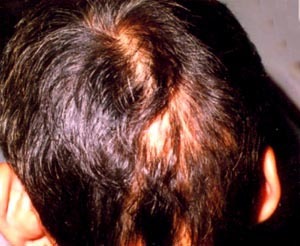 No change on scalp was observed although was feeling mentally better and slight relief in constipation was reported. Placebo was repeated for one month. Hair growth was seen on scalp, constipation was much better so placebo was repeted for one month. Further progress in hair growth was not observed constipation was ok. Tarentula hispanica 200 ( single dose) was given followed by placebo for 01 month. Hair growth was much better no constipation was reported. So placebo for 02 months was given with the advice to stop the treatment. Final photograph of the scalp was taken.